Yellowstone is in the books! I guess the first thing to discuss is the travel aspect of the trip. What did we do and where did we go? In addition to the focus on experiencing living things and environments, the Experiencing Life concept is about the human experiences that make life interesting and fulfilling. To that end, journal-type entries will be a part of this blog. We made the outbound trip into a three-day affair, stopping at Denver the first night and Sinks Canyon the second night before arriving at our campsite in Yellowstone for the third night. The reason for Denver is that it was a good distance for our first day, since we left around noon, plus we wanted to stop at a restaurant called Casa Bonita. Rebecca and I both remembered it from our childhoods but hadn’t been there for thirty years or more. We thought we should let her daughter, “Z”, experience it. Casa Bonita is like a cross between a theme park and a restaurant. One of the highlights for many people is the waterfall inside and the cliff divers who perform right next to it, diving into the pool below. It is honestly not the best food, but that’s not why you go there. You go for the experience, and it was a good one for us. The next day was the one that really started the biology part of the trip. After a brief stop at Independence Rock, an important landmark on the Oregon Trail, we headed to Sinks Canyon. 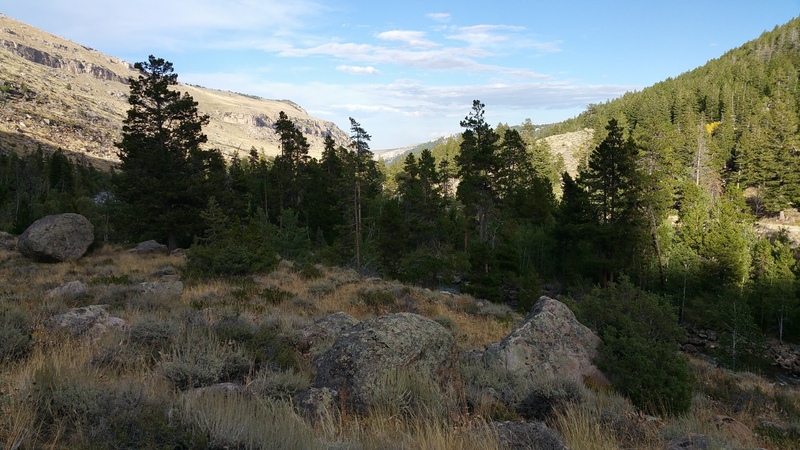 Sinks Canyon is on the southern part of the Wind River mountain range, which is part of the greater Yellowstone ecosystem. We had been to Sinks before and we picked the campsite right next to the one we stayed at previously, since part of the beauty of the site is being right next to the rushing water of the Popo Agie River (pronounced popojah). The weather was beautiful and we had a little time to explore the canyon after setting up our tent. We started up the Middle Fork Trail towards Popo Agie Falls, even though we had no intention of going all the way to the falls. Along the trail, we got a good view of both sides of the canyon. The difference was striking between the heavily-forested north-facing slope and the relatively treeless south-facing slope. This phenomenon is due to the fact that the sun hits the south-facing slope more directly, drying it out faster than than the north-facing slope. The evergreens that dominate the north-facing slope need more water than what is available on the south-facing slope so they are unable to grow there. This is a good way to experience the fact that plants need just the right amount of sunlight and the right amount of water. It’s not always about how much rain actually falls but how much stays in the ground, and the canyon shows this well. It is not like the south-facing slope is devoid of all plant life. 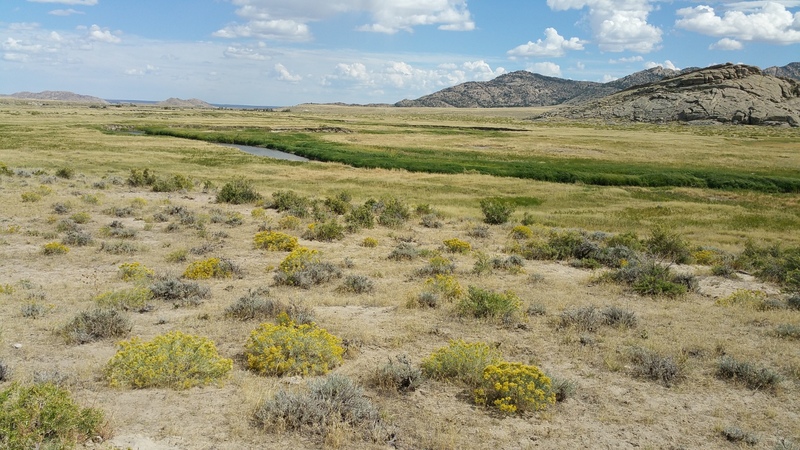 Certain grasses and sagebrush do just fine with the amount of water available there. And without the evergreens being able to grow, eventually creating shade, they also get the sunlight they need. Ignoring the trees in the foreground, look at the canyon slopes behind them and compare the left and right sides. The nearly treeless slope on the left faces south and the forested side on the right faces north. I also got to see a plant I hadn’t seen before along the trail. Barberries (Berberis spp.) kind of look like blueberries from a distance, but upon closer inspection, they are obviously not blueberries. The leaves look like holly leaves, with their spiny, prickly edges. Blueberry leaves have smooth edges. 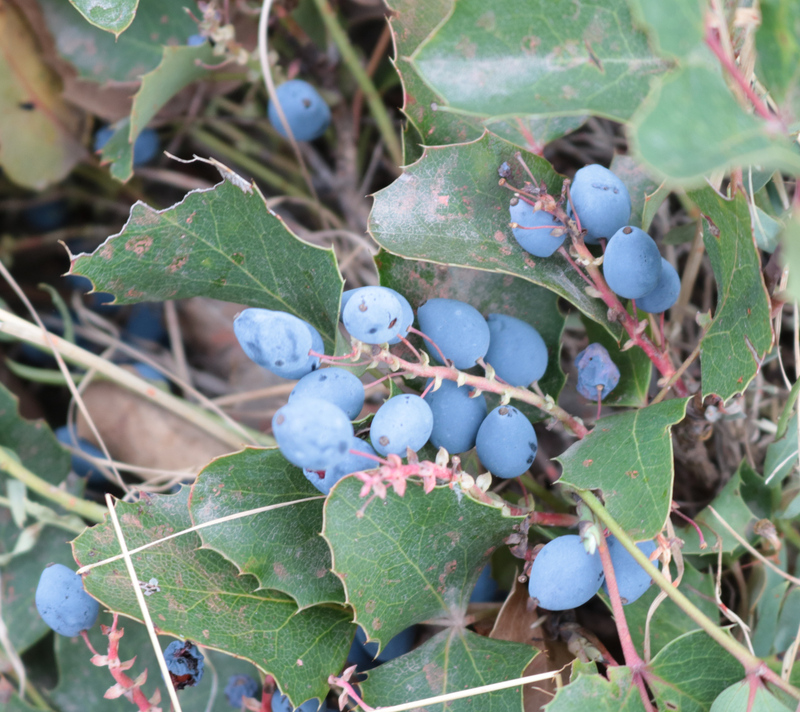 The berries of barberries may be the color of blueberries but they do not have the distinctive craters or collars that blueberries have on the opposite side of where they attach to the stem. Good find. It is the first representative of the genus Berberis and only the second genus from the family Berberidaceae I have observed. Discovering a new find like this is the main inspiration for this whole Experiencing Life idea. I’ve never been a hard-core birdwatcher but I know the dedicated ones have lists of the birds they observe called “life lists”. This series also has a life list concept except that far more than birds are on it. The goal of Experiencing Life is to see living representatives from all of the phyla of living things and more. Instead of hunting as many species as possible, the goal is to get no more specific than the family-level in most cases. For some microscopic organisms, the goal is just to see at least something from the phylum, not every family within the phylum. For a few families, such as the family to which humans belong, the goal is indeed to see every species from the family but, in the case of Hominidae, there are only seven living species. So instead of depth, the goal is breadth. I am in the process of publishing the life list for the series that we can call the “Experiencing Life List”. Look for it soon. I’ll make a post dedicated entirely to the list when it’s done. But it’s not too early to think about how the barberry would be treated. The only other plant I’ve observed from the family Berberidaceae is the Mayapple (Podophyllum peltatum) in my home state of Kansas. So I could already have checked off a representative from that family. That’s okay. Now I’ve got two representatives from that family. And one is something I’ve never experienced before. It’s still exciting to see new things and to know it’s new, which is the real purpose of Experiencing Life! You will eventually realize some groups on the list are common all over and some are not. Then, when you see something from from one of the groups that are rare, it will make it that much more rewarding. So what else did we see? While still in Sinks Canyon, after finishing our short hike, we drove up a series of switchbacks towards Frye Lake. As we climbed higher, we could see pockets of yellow interspersed among the dark green pines and firs. 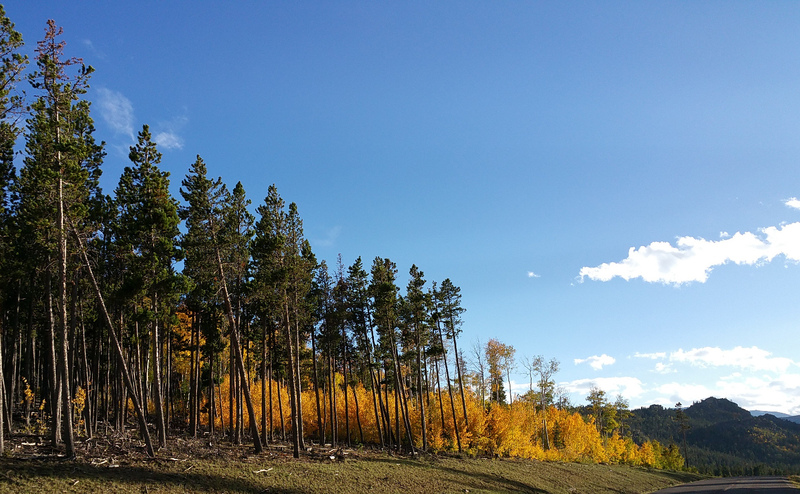 Yellow is the more common color for aspens in autumn. It was nearing the peak season for the Aspen trees (Populus tremuloides) to turn color. 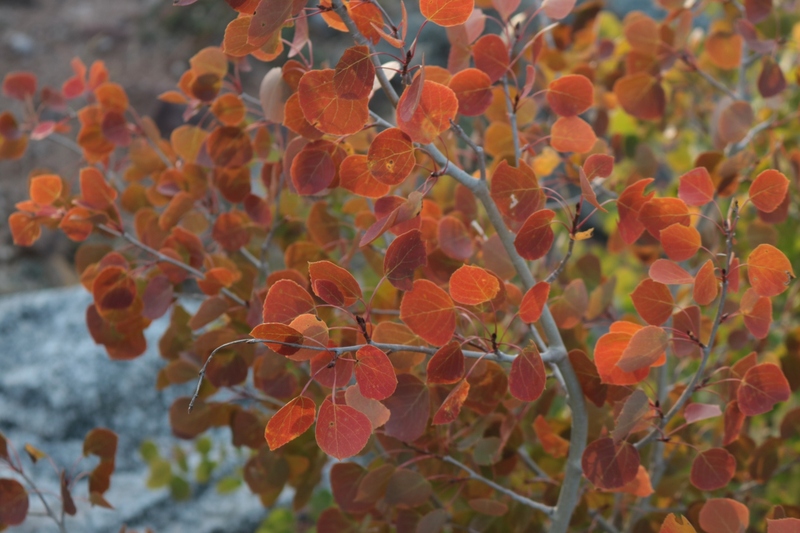 The interesting thing to me in the area around Frye Lake is that some of the Aspens were reddish-orange! Aspens are the tree that turns color during autumn in the mountains of the west and I’d seen plenty before. Always yellow. And there were plenty of gloriously yellow ones here. But some were very orange, almost red. Beautiful! I have never seen aspens with leaves this color. If this is a common phenomenon and I just haven’t heard of it, someone please leave a comment. Is orange a transitionary color as the trees turn from green to yellow or is orange the final color for some trees? Either way, it was exciting to see. Then it was back down the switchbacks to our campsite. But just before we reached the valley floor we saw a lone Mule Deer (Odocoileus hemionus). For better or worse, deer have become less exciting to see for me. When you’re worried about hitting something on the road, it tends to become less exciting. In eastern Kansas, where the potential road kill is a regular possibility for me, the deer are White-Tailed Deer (Odocoileus virginianus). Mule Deer, like this one in Sinks Canyon, do not get much farther east than western Kansas, so at least this was somewhat uncommon for us. There are a number of features that distinguish Mule Deer from White-Tailed Deer, but the main one that served our purpose for identification was the one about their rumps. White-Tailed Deer have a larger tail that is reddish-brown, like the rest of their body, on top and white underneath. When their tail is down, it covers a small patch of white on their rump itself and all you see is the reddish-brown. When alarmed, their tail raises up, revealing what amounts to a long, white warning strip. It is only when their tail is up that you see the white. On Mule Deer, their tail is much shorter and narrower, which allows the larger patch of white on their rump to be visible whether their tail is up or down. This one had plenty of white visible with her tail down. Mule Deer get thier name because their ears are larger than White-Tailed Deer ears, but that is not always easy to gauge without one of each species present at the same time. This one turned and looked at us as we slowed our car down, then slowly wandered up the bank into the woods. Notice the small tail is down and you can see plenty of white on the rump. 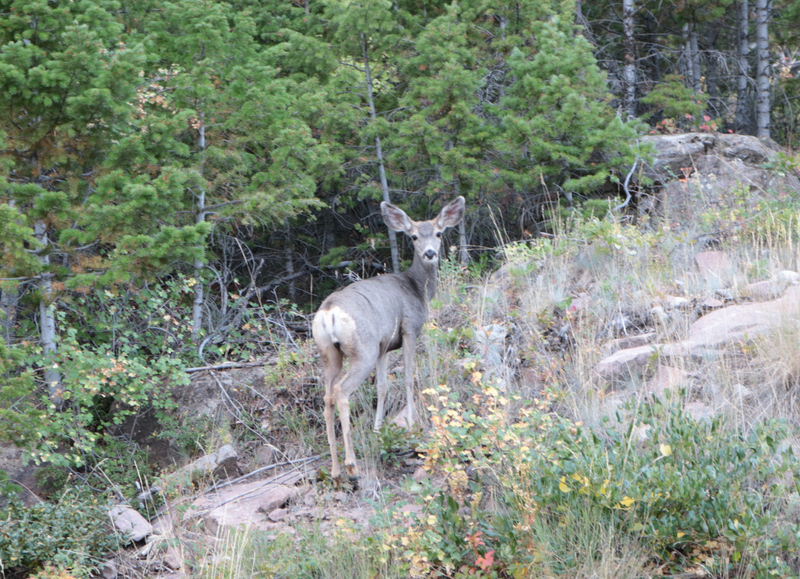 This is a feature that distinguishes a Mule Deer from a White-Tailed Deer. When we got back to our campsite, we found out what “open range” means. There were cattle (Bos taurus) next to and right on the road. If deer have become less exciting for me then I don’t know what to say about cattle. They are everywhere! It would be interesting to play a game where we timed how long we could drive without seeing a cow. From start to finish on this trip, I’ll bet that we didn’t go longer than twenty minutes without seeing a cow. (Except when we got into Yellowstone. No cattle there.) But it was kind of novel to see them out blocking traffic in Sinks Canyon. Rebecca and Z loved it! Some of the highlights of the trip for them involved cattle, horses and domestic dogs, none of which are high on the scale of uniqueness. No fences here. Notice the cattle in the distance that are on the road. In fact, cattle and deer are not that different from each other. They are in separate families, but those families are both within the group called Ruminantia, the ruminants, which is at a level somewhere near an order. Cattle are in the family Bovidae and deer are in the family Cervidae, but they both are in this group that includes the two-toed grazers. Others in this group we would end up seeing on this trip include Bison, which are also in the family Bovidae, and Elk, which are in the family Cervidae. 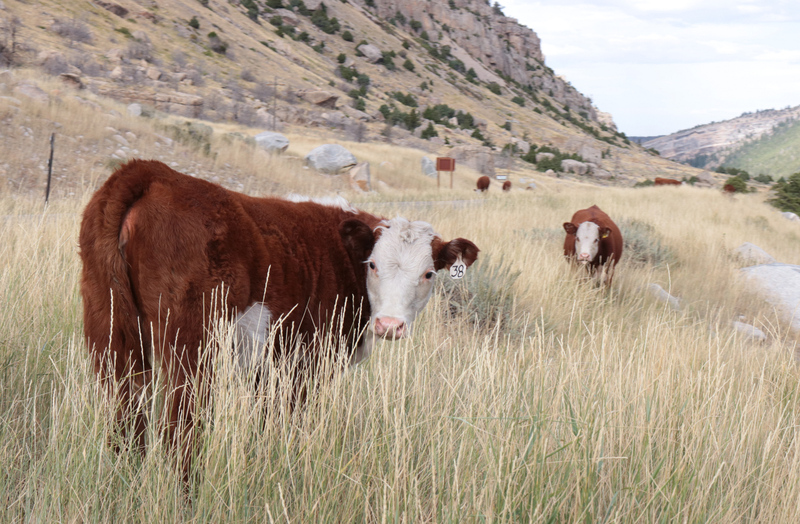 We had also been seeing ruminants from a third family since we entered Wyoming. Pronghorns are in the family Antilocapridae. In fact, they are the only things in that family. We’ll discuss these three animals in a later post. As it is, back in Sinks Canyon, we’ve seen two ruminants back-to-back. The sun was dropping behind the canyon walls, even though sunset was still a ways away so we were done exploring for the day. We made some dinner on our little backpacking stove, sat by the Popo Agie for a bit then settled into the tent and our day was done. I mentioned that earlier in the day we made a stop at Independence Rock, one of the landmarks of the Oregon and California Trails. It was just meant to be a historically-oriented stop that we wanted to visit this year since we drove right by it when we followed the Oregon Trail all the way to Portland the previous year, but it turned out to have some interesting biology experiences as well. For orientation, Independence Rock is a dome-shaped rock jutting from the Wyoming plain about 130 feet high. There are mountains towering much higher around it, so it doesn’t even stand out from any distance at all. But the Sweetwater River, the main throughway for the pioneers after leaving the North Platte River, runs right by Independence Rock, so it was well-documented in journals from the trail. For us, an exciting moment came before we even reached the rock from the rest area that doubles as a parking lot for the landmark. There were some thistles near the base and we saw something hovering around the flowers. It looked too big to be a bee and too small to be most birds. As we got closer, we could see that it was hovering in place like a hummingbird would, but even then it looked like it was too small to be a hummingbird. We kept walking closer and it didn’t fly away so we were finally able to see that it was an insect – an almost thumb-sized insect hovering like a hummingbird! After doing some checking, it turns out that there are insects called Hummingbird Moths. But, after more research, I discovered that this was not one of those. 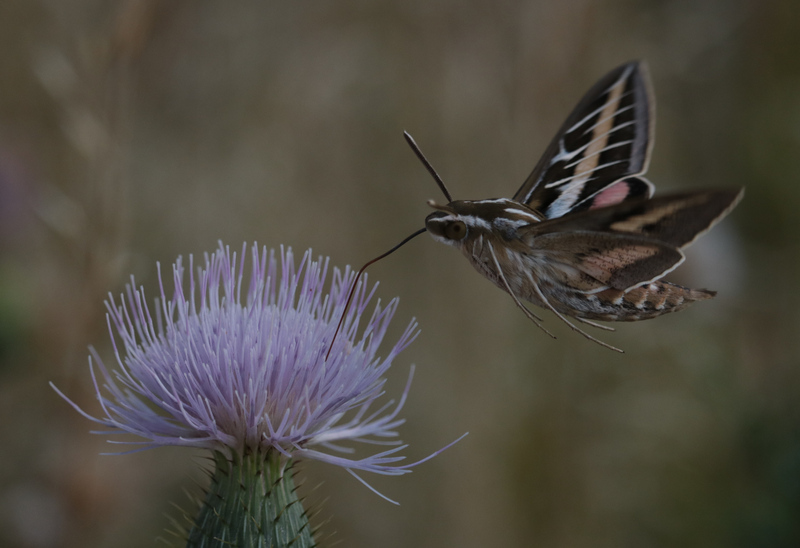 It was a White-Lined Sphinx Moth (Hyles lineata), just suspended over the thistle flower with its proboscis sucking out the nectar within. The class of insects (Insecta) contains more known species than any other class of organisms, and the order containing moths and butterflies (Lepidoptera) is one of the larger orders of insects. It is not really enough to just see one thing from each family of insects when there is so much variety. For now though, we can check off a representative of the family of moths called Sphingidae. One last tandem of organisms I’ll mention from Independence Rock has to do with rabbits. Around the base of the rock, on the side opposite from the Sphinx Moth, we went to investigate a small cave formed by fallen boulders. Inside we saw some species of Cottontail Rabbit (Sylvilagus sp.) just hanging out in the shade of the cave. Even after startling it when we first saw it, it stayed still for us long enough to take some pictures. Wyoming has seven species of rabbits and hares, but this was definitely not a hare or a jackrabbit, nor was it a pygmy rabbit, so it had to be one of three of the cottontail rabbits. All of the cottontails are in the same genus (Sylvilagus) but I am not sure which one it was. Many people think of rabbits as rodents but they are in a separate order of mammals called Lagomorpha (rodents are in the order Rodentia). The two orders are similar enough to be the only members of a higher classification called Glires, but they are in separate orders for a reason. The reason has to do with their teeth. Lagomorphs have enamel all the way around their incisor teeth and rodents only have enamel on the front of these teeth. 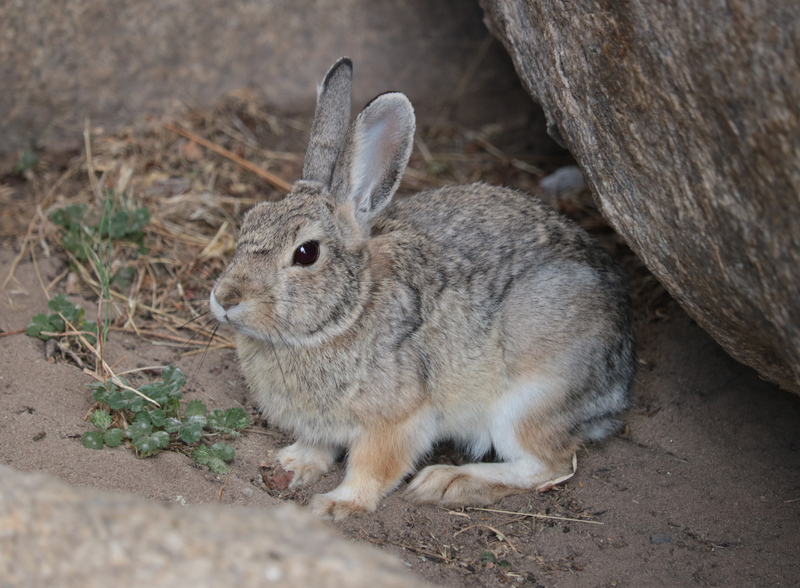 There’s more to it than that but the differences are enough to consider rabbits, jackrabbits, hares and pikas to not be rodents. You can read more more about the differences here. The second part of the rabbit tandem, besides the cottontail, was Rabbitbrush (Chrysothamnus or Ericameria sp.). This is a sagebrush-like plant with many, small, yellow flowers that we had been seeing along the roads through most of Wyoming. When we got to Independence Rock, there was quite a bit of it there as well. We might not have noticed the plant, or we might have mistaken it for sagebrush, if it wasn’t September, with the flowers in bloom. But they were in bloom and it became one of those plants we just had to know about. Scattered among the sagebrush at the base of Independence Rock is some species of Rabbitbrush. A closer view of Rabbitbrush. It seems to be unclear how rabbits got involved in the name; apparently they don’t eat the plant. Maybe rabbits were seen hiding behind it which prompted someone to come up with the name. Who knows? Sometimes common names are hard to trace. That is why globally-accepted scientific names are created. Let’s say the rabbitbrush we saw was “Yellow Rabbitbrush”. Some people call the exact same plant “Douglas Rabbitbrush”. But the scientific name for that species of Rabbitbrush is Chrysothamus viscidiflorus. That is the name accepted by the scientific community to refer to plants of that species (though I am not at all sure if that is the species we saw). To drive the point home, there is a member of the cat family that goes by “Cougar”, “Puma”, “Mountain Lion”, “Catamount” and “Panther”. They are all one-and-the-same, scientifically known as Puma concolor. 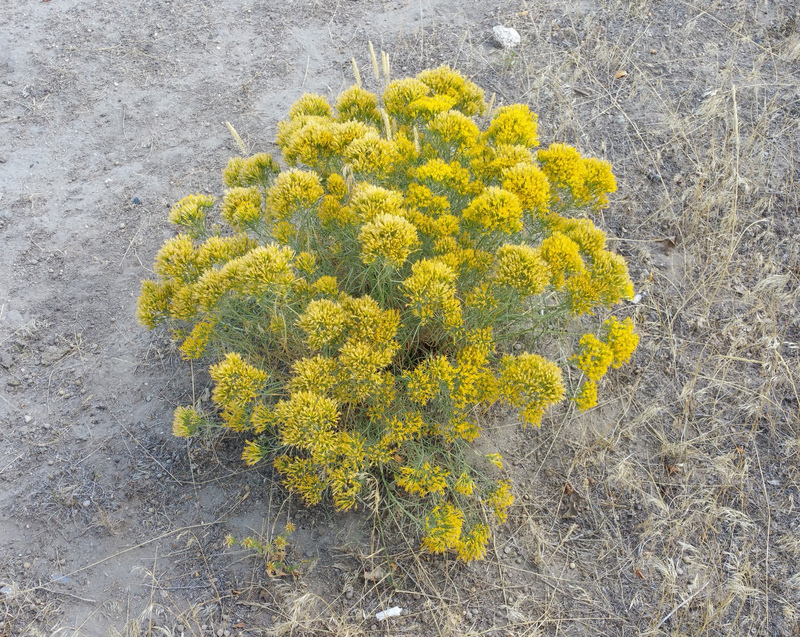 For our purposes, no matter which species of Rabbitbrush we saw, it would be a representative of the family Asteraceae. I already know we will experience many plants from that family, but this one was new to us and it was exciting to see it in bloom. That will end the flashback to Independence Rock. I’ll finish this post with us back in Sinks Canyon falling to sleep to the sound of the Popo Agie’s rushing waters. See you soon where we’ll pick up with the trip from Sinks to Yellowstone along the Wind River Range. After a few weeks of trying to make sense of and organize our experiences, I have decided to slightly modify the scope of Experiencing Life. Instead of trying to be an entire biology textbook, the scope will be focused on where things can be experienced. Those things may be living organisms or environments or even rock types or planets. To appreciate what is being experienced, some background will often be helpful, so there will still be plenty of background science, but the focus is now on the where and what more than the how. There is a lot of information out there on the how, so I have decided not to try to rehash everything on my own.